Available for FREE keyword research nowadays. 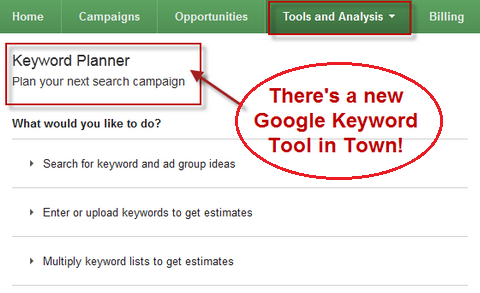 AdWords Keyword Tool is closed for good. Keyword Planner combines the functionality of the Keyword Tool and Traffic Estimator into a smooth, integrated work flow. Example of keywords: trade stocks , make money , CPM AdNetworks . Means that you can use this tool from now on to find keywords and group of keywords, as well get performance for them to receive the bid and budget which best fits your needs. You can go further and build a plan, add ideas or delete ideas and change your bid range to see total estimated clicks and cost. Going forward, you'll have to log in to AdWords to use Keyword Planner, which will enable you to get customized results and estimates at a real analysis. SEMrush.com - Created by SEO/SEM professionals for SEO/SEM professionals. They have the knowledge, expertise and data to help you take your projects to the next level. They collect massive amounts of SERP data for more than 95 million keywords and 45 million domains, including: AdWords ad copies and positions, organic positions for domains and landing URLs, search volumes, CPC, competition, number of results, and so much more. KeywordSpy.com - Currently operates in USA, United Kingdom, Australia and Canada. Through this keyword tool and keyword software, you can perform advanced keyword research and keyword tracking to study what your competitors have been advertising in their Adwords campaigns and Other PPC campaigns. You can now get complete in-depth analysis, stats, budget, affiliates & ad copies of your competitors. SEObook.com - "Aaron Wall's SEO Book is the best guide I have found for getting serious web visibility." - Professor J. Michael Steele, The Wharton School. And now you can hire Aaron as your personal SEO coach for just around $10 per day! A special opportunity for 1,000 webmasters to learn SEO directly from Aaron Wall & the SEO Book team!